When we find a solution that our customers find works well with Microsoft Dynamics GP (GP), we like to ‘give props’ (meaning giving it the proper respect it deserves). The solution our customers are finding extremely valuable is Nodus CREDIT CARD ADVANTAGE™ (Nodus CCA) and integrating this product to their GP Sales Order and Invoicing, AR or Cash Receipts processes. This solution has saved our customers time, headaches and payment delays! Many customers have a merchant account for taking payments via credit card. However, this system or process is totally separate from the transactions in GP. So typical scenario, customer calls and wants to place order and prepay. Sales representative enters the order into GP and then gathers the customer credit card information. Then later that day, they either processes this credit card transaction through the merchant website or through a terminal sitting on someone’s desk in accounting. Once the payment has been approved, the sales representative can add the payment then to the order or the accounting department enters the payment through the Cash Receipts window. All multiple steps that add no value and steps can be missed if the payment is declined or incorrect CC number is used and the customer order is delayed due to denied transactions. 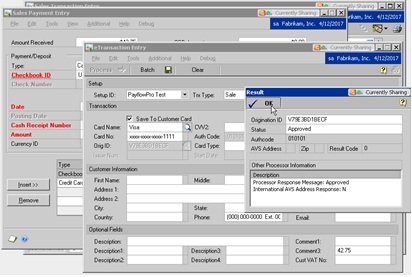 Now imagine having your sales representatives enter orders and process the CC payment all in one window. Once the CC is approved, the order is ready to be fulfilled and shipped. 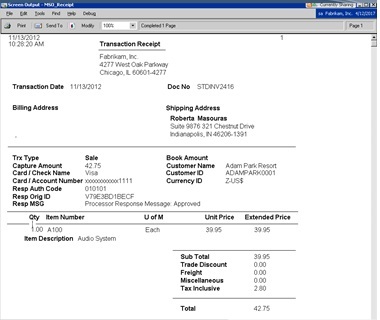 An email can be automatically sent to the customer with their CC receipt and copy of their Invoice. Sound like a dream? 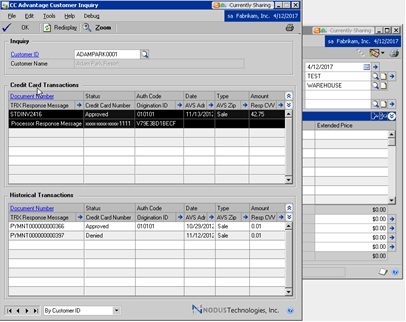 The Nodus CREDIT CARD ADVANTAGE™ is fully integrated into MS Dynamics GP and allows users to enter electronic transactions directly into their Sales or AR modules and have those payments verified via the web without leaving the Microsoft Dynamics GP environment. CREDIT CARD ADVANTAGE™ integrates with each of the main sale modules. Electronic transactions can be processed individually in real-time mode or saved to a batch for efficient bulk processing. CREDIT CARD ADVANTAGE™ allows for the use of multiple merchant identifiers within the same company, interfaced with multiple processor and payment gateways. With Nodus CCA, transaction processing is fast, secure, and reliable. You know immediately through GP what the status of the CC payment is at and throughout the process. Best thing customers liked about this solution: fully integrated with GP saving several hours per day in processing credit cards and posting payments with just a few clicks. Customer CC wallet – store multiple CC numbers for a customer, which are not on GP or tables within GP. With the latest release of CREDIT CARD ADVANTAGE™, Nodus is encrypting the ABA, Account Number and Social Security Numbers only in the Credit Card Advantage tables. Can have tokenization where the Customer CC numbers are stored at the merchant site/payment processor using PayPal . Batch mode processing or real time.